Despite, “Snow-klahoma!” being cancelled three weeks ago because of the blizzard, it went off without a hitch Friday and Saturday nights. Shayla was in all her glory and loved absolutely everything about it. As Shayne told and thanked the director last night at the cast party, “There could not have been a greater gift for Shayla.” As you can see from the previous post of the slideshow, she had a blast! For Friday night’s show Aunt Marty and Uncle Jeff came up, as did “Harriett” (who would have driven to Oklahoma because she heard, “Shayla’s in Oklahoma!”, but thankfully Chris drove) and therefore she arrived safely! Chris brought her the cutest gift! 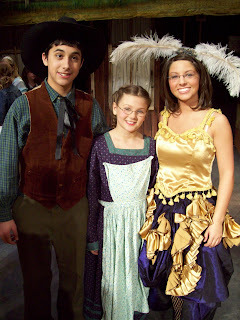 It was her two favorite animals (a horse and a dog) dressed like the leads in the musical. 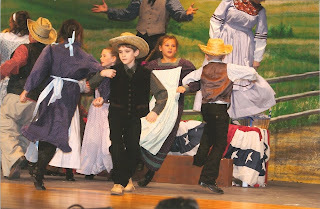 Curley with his cowboy had and Laurey with a wedding dress and bonnet. Shayla REALLY liked that! The children (or the “little people” as the high schooler’s called them) were arranged in “families” and Shayla loved her “mom” and “dad”. Her dad sent her a flower back stage and on the card he wrote, “You are the sweetest kid ever,” it was precious. I loved watching all of my former students perform. Some of them I not only had for junior high, but also for kindergarten; that was amazing! The talent of those kids is unbelievable and with the new facility the show could not have been any better. What a blessing to have been able to partake! It was announced that the cast party would be at the lead’s home at 11PM. Well, I assumed it was for the high schoolers, but after Shayla changed she asked if she could go. I told her for just a little bit and her smile was incredible. We let her stay for about thirty minutes and she had a ball running around with the other little girls. The high schoolers shaved off “Jud’s” beard and since his mom said he had to serve Mass for Easter Sunday looking all scruffy she told me to supervise the shaving since I would be at the cast party and she wouldn’t. It was a hoot! Shayne and I have commented many times that Christi would not have just memorized her lines, but everyone’s. I trust she was with us, from a much better place. 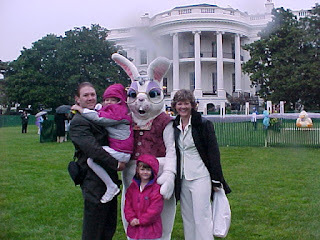 (White House Egg Roll, 2004)Trust me, I am NOT complaining! I absolutely love being busy (when it does not involve rushing around with unhealthy loved ones)! It was a very long, tiring week. After getting home at midnight, we returned to school on Tuesday morning and I returned to Ohio State this week as spring break is over and I begin my FINAL quarter of classes, praise the Lord!! 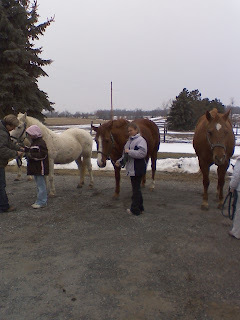 Shayla was incredibly busy after school every day with ballet, jazz and horse lessons. Then it was a quick bite to eat and off to musical practice. She returned home close to 10PM each night, but never once complained; she's absolutely loved all of this! Everyone has been very sweet to her and she will be saddened tomorrow when the curtain falls for the final time. Shayla did not think this trip would be good for a “guessing game” because everyone knows all about Washington DC. The trip may not have been the best choice in terms of trying to avoid memories and emotions, but Washington DC was on our way home and we thought it’d be educational for Shayla. Therefore, after we left glorious Colonial Williamsburg (where we could have easily spent a third or fourth day) we drove up to DC. Some may remember that Christi was invited to participate in the White House Egg Roll in 2004 (a glorious event we will forever cherish). When I first looked at hotels, the cheapest rate I found was at the same exact hotel we stayed in for that event. Well, I couldn’t handle that so I picked the next cheapest one. We really enjoyed touring and being together in our nation’s capital. Much to our surprise, we walked around the White House and discovered they were setting up for the egg hunt – the exact event we were really trying to avoid, and then we learned that "The Jonas Brothers" would be playing the next day at at Egg Roll so (we needed another knife in our heart or something) we went back to see if Shayla could see them at the actual egg roll on Monday. I fought back tears as we stood outside the gates watching the little ones and their families. Shayla really enjoyed the city and is an amazing traveler!! At the Natural History Museum Shayne and I were both without our breath for a bit when we walked into the mammals room and both distinctively remembered Christi sketching, for a lengthy time period, in that room. Shayne also entertained the girls in the city in July of 2004 while I was attending teachers’ meetings. Although sad, I did enjoy seeing the places he took the girls. He is the most amazing dad, and husband. Recently, I told Shayla Christi had been dead for a year and a half and she said, "Really? I thought it was three years." I'm not certain why that comment keeps haunting me, but it does. When I was in the midst of throwing together this trip, I really wanted to attend church on Easter at the National Cathedral. Well, all of their Easter service tickets were gone so we decided to just visit the church instead in between services. As soon as we started walking up to it, I realized it was a mistake and that it was too hard, but Shayla was very excited about seeing inside so we went on in, but it was hard, very hard for both of us. When we arrived in another city on Saturday night and checked into our hotel, we were upgraded to a suite! Yahoo! 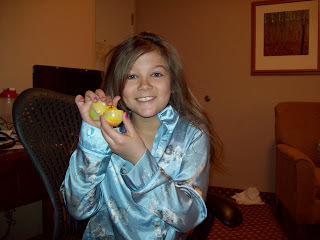 It worked out very well with the egg hunt that had to take place in our hotel room on Easter morning. Shayla woke up, came into our room and cuddled with us for a while. She went to the bathroom and we heard her yell, "Is it Easter because there are eggs in here?!" She had a ball and I just kept telling myself that Christi lives on through Shayla. Well, I couldn't manage the thought of being home, without Christi, for Easter so I planned a last minute get away and it's been quite helpful medicine! After Shayne came home from work on Thursday we drove to Colonial Williamsburg. The ten hour drive didn't seem like it because two of us slept. The amazing Shayne drove throughout the night, just like he did so many times with Christi. We even took the same roads for quite a while before heading south so I worried that it was too much for him, but when I inquired he responded he was doing ok. Today I learned we had inches of snow at home, so I'm doubly glad we left town! In preparing for the trip last week, we learned that they have costume rentals for the children, so Shayla and I did some Ebay searching looking for little girls Colonial dresses. 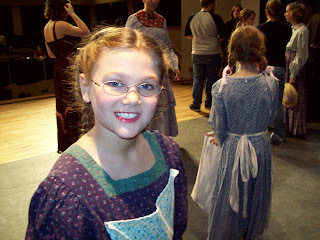 Well, when she saw them she decided she liked Pioneer style better. Even though it wasn't the same time period, she said, "I'll be a girl of the future!" She had a ball on Friday, dressed in her Pioneer dress and receiving so many compliments on how well she was dressed and so many tourist asking her if I made her costume (Shayla you didn't really need to laugh that hard each time!) or if we'd found it in a giftshop. As you can see from the 100 photos, taken on Friday, we had a non-stop 11 hour day learning (and living) history! (OK, I decided to go with all 100 photos on Photobucket, but in about five sections (posted below) because I just hung up with my mom and I know she wants to see all 100 - God bless her!!) Being there with a very excited little Miss Elizabeth (yes, we changed our names to be more Colonial, hee hee) was absolutely incredible for William and Anne Thomas (aka Shayne & Angela)!! We have now ventured to a new city, made it through Easter and will share a few pics soon. Until then, be well!! Shayne made it to the cemetery; I couldn’t bring myself to go out there yesterday. It’s all just so sad. I try to remember her last Easter with us and how well she was feeling and how happy she was, yet it does little to ease my sorrow. I tell myself she’s free of pain, yet it doesn’t help with my own selfish desire of wanting her here in my arms and wanting to see her face discovering her Easter basket. Much to my shock, yesterday at school one of my sweet sweet students inquired during class, “Mrs. Thomas, you seem depressed or something today. Are you ok?” That totally caught me off guard, but I immediately reassured her everything was fine and with spring break starting on Thursday how could I not be happy. I think she believed me; at least I didn’t hear her mutter “Liar! Liar! Pants on fire!” under her breath or anything (smile). She responded, “Well that’s good because you don’t seem like your usual happy self today.” I made it through the day ok, got Shayla to her jazz class, purchased items for her Easter basket, took her to her final ice skating lesson and then came home……and sobbed. And then like a fool, finished reading "Friedrich" by Hans Peter Richter. The Jewish boy who captured my heart died. Today I had high hopes of removing all of the items that were on the display boards at the funeral home, but I don’t know if I can bring myself to do that just yet. I will one day scrapbook about Christi’s life, but I need to get everything sorted out first. Those boards may just have to wait until more time has passed. (Besides I do smile when I remember how one of my aunts told me that it was the only time a funeral home ever looked like an elementary classroom with all of Christi’s pictures and art work on display!) I recently told a colleague at lunch that I finally cleared out Christi’s bedroom. She told me that was wonderful. She lost her son ten years ago and there are things in his room she still hasn’t touched. 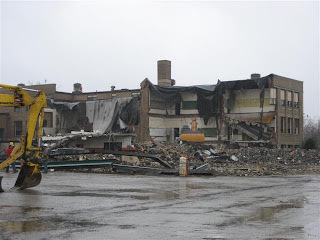 My k-6 elementary and 9-12 high school and Shayne’s high school was demolished this week. I didn’t think I’d be so sad to see it, but I was moved. Although I remind myself how incredible our new school is, seeing our old one – along with all of our wonderful memories – torn down added d to my sadness. ON A MUCH BRIGHTER NOTE: Shayla decided to take Swiffer to the fair and to enter him in the "Pet Rabbit" category. I read all of the posts and emails to her about the tattooing and that was helpful in her decision making - THANK YOU! I cannot believe today at 9AM will mark the one and a half year anniversary of Christi's departure - eighteen months without her, ergh! I cannot believe how terribly sad I still am. I wish I could at least pick up the phone and call her and hear her little voice!My thanks to sweet Olivia for sending me this poem. 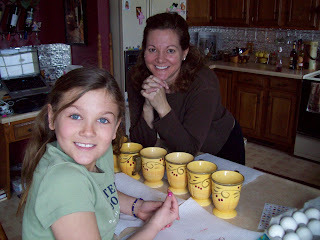 I am missing you, sweet Christi! are windows looking out of heaven? Hopefully, no one will recognize the bar "The Clover Club" and no one will realize we took Shayla to a bar for dinner on Monday evening (smile). It was great to meet up with Shayne's mom and her friend and, much to my surprise, dinner was wonderful! Happy St. Patrick's Day! Many times this evening I thought back to our NYC days and St. Patrick's day in 2003. On that day we did not realize Christi was to have yet another day of stem cell harvesting and in the afternoon we received a phone call from the Day Hospital asking where Christi was and why she didn't show up. PIC: Yet another day of harvesting her stem cells (Christi, age 5, March 2003)Well, I guess it turned out to be a wonderful thing! We said many times throughout her treatment years that the goal was not to die with extra stem cells and despite trying to have just enough, she died with stem cells in the freezer! Today I was very happy we took her to the St. Pat's (incredible) parade in NYC instead of subjecting her to spend yet another day trying to collect stem cells!! Shayla on Shayne's lap (March 2003) at "Start with Art" at the Met in NYC! (With teachers Caroline and Nitza, we still keep in touch with them!! )We didn't receive the greatest of news at the eye doctor's this afternoon. Her doctor feels her right eye is starting to slip back into the problems she was having before last year's many months of vision therapy in Toledo. Ergh! I knew that it could happen, but because she's doing remarkably well with reading, I never thought of it! (Her third grade teacher came to me last week telling mne she tested Shayla's grade level for reading and it is a sixth grade level. She's now moving on to some independent reading work at school and is reading "From the Mixed Up Files of Mrs. Basil E. Frankweiler" - a great story with a reading level of sixth grade, eighth month. The story takes place at the Met in NYC! 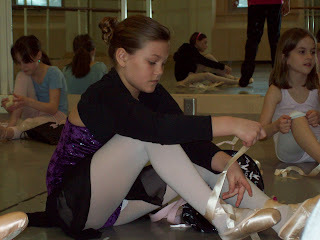 Shayla remembers her days at the Met with great admiration!) Soooooooooooo, we won't have that "eye patch burning party" she talks about quite yet; we are now back to doing daily eye exercises to try to get her right eye back on track, but at least we don't have to travel back to Toledo. (Amazing to me is she gained five grade levels in reading in a year. Her uncle Jeff recently joked with her, "Keep that up you'll be going off to college next year." Upon hearing that, she blushed, looked down and had a large grin. Yes, a bagpiper in the bar. (See? Culture and education, right?! Hee hee!) Next we went to musical practice where she had a ball! I continue to marvel over her amazing attitude, drive and spirit; what a blessing! We are so blessed to have her!! Today I contacted a friend (and single mom) who lost her only child to neuroblastoma on this day in 2004. Thank you, dearest Lord for Shayla!! I am not worthy of this incredible gift! Our thoughts and prayers continue for Christi's best friends' parents. One is back home after being life flighted to Toledo, another is having surgery to remove a tumor in the brain tomorrow. May God be with them all. May God give them strength and courage. Those girls have been through too much at their age! Shayla had a very busy, very pleasant day – until early this evening then everything changed. Now she won’t admit it, but I think she has an upset stomach – and probably a broken heart or at least a big disappointment in her soul. 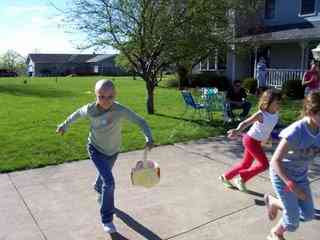 This afternoon we colored Easter eggs, then went to a very cold, but very nice egg hunt. It was a great day together. 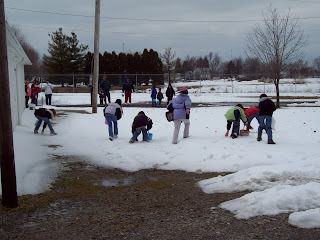 PICTURE: Yes, an egg hunt in the snow! Now we are home from her 4H meeting where she read in her Pet Rabbit book they gave her that she has to get her bunny tattooed in its left ear. Shayne took her over to the advisor for clarification and Shayne said you could just see her spirit sink as she learned it would hurt the rabbit. (I also can’t help think what she’s picturing in her mind with how it’d look after it has been tattooed.) Of course I tried to make light of it and said, “Perhaps we could just get a washable Sponge Bob tattoo and that’d be ok.) Once at home she asked me if she could call her friend because her sister took a pet rabbit before and she’d know if all pet rabbits have to get tattooed or not. Unfortunately, the friend’s not home. I’ve emailed the advisor. Shayla has decided that if she has to do it to her rabbit, she will not enter the bunny for her fair project. Her disposition and her sadness remind me with incredible likeness of Christi’s reaction when I explained abortion to her in the summer of 2006 She asked me what the bumper stickers and billboards were about. I told her and she just sobbed and sobbed. A couple of weeks later, we pulled into Cedar Point and she saw another bumper sticker, burst into tears and said, “How could anyone do that mom?” I wish she would have died never knowing about abortion and I hope Shayla, who has talked for years of entering “Swifter” in the fair, is able to enter without having to tattoo it. Please keep your fingers crossed until we find out for sure. THANKS! Well, one could assume (with great accuracy) that I've lost my mind (and most likely my wallet). We've decided to lease a horse so that Shayla can be in a (second) 4H club and show a horse at the fair in addition to her bunny, Swifter. Today she had her first (horse) 4H meeting and again I was beyond impressed with these amazing 4H advisors and their program! There are seven new club members (all seemed about 9 years old, fancy that! Shayla was in all her glory and I just kept thinking, "Christi would have absolutely loved all of this!") and they had a special meeting just for the new girls today. Some of the older girls were there, during this 2 1/2 hour meeting, and Shayla really enjoyed it all as they pretended to be the judge and taught her what she needs to do. Shayne arrived home from Vegas and that has been fabulous! I am once again reminded how very blessed I am to have him. During Christi's treatment years we saw many single parents and I know they all really struggled. I'm so lucky to have a wonderful husband! Friday, at school, I learned of some horrible health issues with two of Christi's best friends' parents. While I'm actually scared to call their homes to see if the news is true and to offer my help, it immedaitely put everything into perspective and I felt very foolish for posing my BLAH BLAH BLAH entry hours earlier. Being upset about missing a Christi event does not compare to true hell others are experiencing. I will call their homes tomorrow and meanwhile continue my prayers hoping the news is not true. Some have inquired if there will be a "Christi's Tea" this year in honor of her birthday. We are currently in the midst of planning a modified event. I'll share that information as more becomes available. Our thanks to Olivia for offering her incredible services and help. She is a sweetheart. Shayla is anxious to get back to musical practice next week. The show will be the last weekend in March. 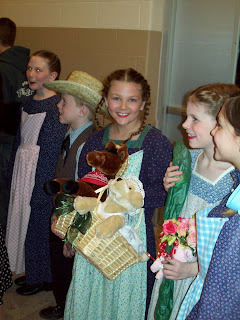 Here are some pictures a sweet mom, who kept Shayla at her house for a few days when we left for NYC with Christi back in 2002, took at dress rehearsal and shared with me. Thanks, Cathy! I'm certain I should just delete this entry and try to get some sleep. It's been a long, tough week. Shayne has been in Vegas all week for work. (Did I really type work and Las Vegas in the same sentence? Hmmmm.) I cannot wait for him to get home; communication has been challenging. I absolutely lost it at work today. About ten minutes before my students walked in, I saw in the paper the "Annual Christi Thomas Memorial Egg Hunt" was held at Tiffin University. We were home, we could have been there, I had no idea it was being held then. I immedately burst into tears and absolutely sobbed. I had been asking Shayne to find out when it was since he sent them the $1,000 check. I know I should have taken care of it myself because I had been wondering for a few weeks when it was going to be, but I didn't and I'm still beyond upset with myself for not just picking up the phone and calling them. 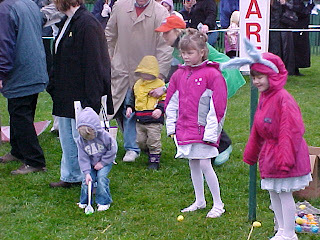 Shayla would have LOVED to have attended the egg hunt and to have helped pass out the prizes and I can't help think Christi is disappointed in me for not knowing when her beloved egg hunt was. Erghh!!!!!!!! I somehow got myself together before my students came in, but it wasn't easy and as soon as we were home from school I picked up where I left off. I think Shayne being gone again and Easter being right around the corner isn't helping. I know I should just go to bed, but I keep ending up crying over missing the Tiffin University event held in her honor. This week I organized all of the 8X10photos ever taken of Christi into three albumns. I know how blessed I am to have them, but it was terribly hard to go through all of that. I also removed all of the special school things she taped on the back of her bedroom door. Reading the applications from the Heidelberg students for the CT $1,000 scholarship has been hard too. PHOTO 1999: OK, I do not know why I put that bow on her head since it doesn't match her shirt, but I've had such a good time with Shayla this week I had to share this photo, taken at the Fostoria YMCA where we used to go after church when the girls were little. 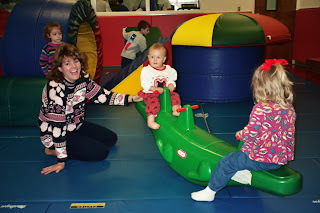 They had an awesome play room for them, and all of us. 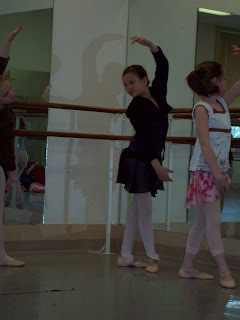 A couple of pictures of Shayla at ballet. 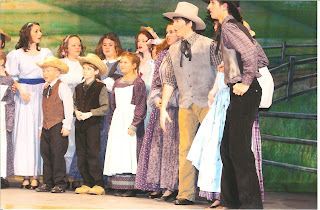 The musical has been rescheduled for the last weekend in March. Because they sold out both shows and had a lengthy waiting list, they are going to try to add a Saturday afternoon show too. Shayla cannot wait to get back to practice. Put a Fork in Me, I’m Done! Shayla had many questions after I exclaimed that to her. I then went on to explain that my exhausting winter quarter at Ohio State was over and that I had a nice long spring break before starting my final quarter of classes. (Although I’ll still have my rigorous doctoral candidacy exams to endure this summer followed by my dissertation research, writing and defense in the coming years, I will no longer be driving to campus to take classes after June 1st! Every time I fill up my gas tank, I cringe! I sometimes wonder if I’d paid more for gas than I have in tuition. I think I really do not want to know.) Regardless, there are over 150 hours on my transcript and one of my most challenging quarters ever is over! It’s been a long five years. I still remember last summer, sitting at the lake and listening to Shayne say, “I don’t know how we are going to make it through winter quarter,” because he knew I had to take a full time course load with winter driving, teach my real job, and I also didn’t want to turn down the opportunity to teach at Ohio State. Could I have done that with Christi alive? Heaven’s no! Would I rather have Christi here? ABSOLUTELY!! Do I talk with her on every drive to and from class? DEFINITELY!! With help from our Father, my dear husband and cheerleader (Shayne), and child care provided by: Aunt Marty, Cousin Tricia, Grandma Nee Nee and dear Sherri, we made it and I thank everyone for their help! PICTURE: Here are the future middle childhood language arts teachers I had the privilege to teach this quarter for Ohio State. This is our “Crazy Middle School Teachers” photo. Shayla had been waiting all year for the "big one" and she finally got it! She spent about three hours playing outside yesterday and I'm certain will want to head out again as soon as she's up. 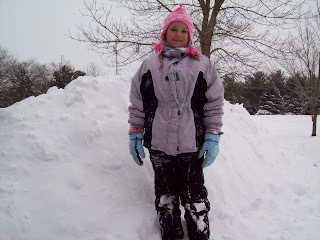 She had a blast; Shayne was exhausted (smile) but really enjoyed catching up with the neighbors (over shovels, hee hee) while the kids played. Be well!! Well, despite my previous post, I was not able to get that video uploaded properly. Wonderful "Webby" to the rescue (again)! Thanks, Eric! Despite "The Show Must Go On!" we received the phone call that the high school musical has been cancelled and will be rescheduled in a couple of weeks. (Our Seniors are leaving for their class trip to Florida on Monday.) Shayla handled the news very well and is currently outside in this mess (smile) with Shayne, play, play, playing! (I'm on hot chocolate duty, whew!) Hope you enjoy the video! 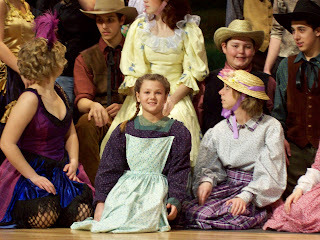 Despite Shayla telling me a few days ago, "The show must go on; there are paying customers," the sold out school musical was cancelled for both Friday and Saturday nights and rescheduled for two shows on Sunday. 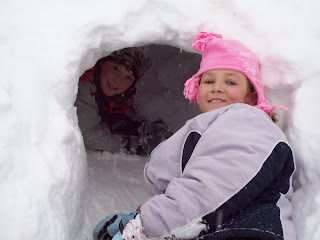 Yet another snow storm roared in on Friday and there are to be blizzard conditions today. Shayla handled the news very well and I think because she got home from the 5PM dress rehearsal after 10PM on Thursday night, we were all happy to just go to bed early. Although I've not been successful with my two previous attempts of uploading video, I am going to try again. Shayne took this at the rink of Shayla ice skating. We are incredibly lucky to have a healthy little girl keeping us going!! I do not know what we would do without her! Thank you, dear Lord, for Shayla!! I hope you and yours are safe, warm and together! Be well! Shayne was to compete in the Arnold Schwarzenegger “Pump & Run” competition over the weekend in Columbus, so Shayla and I left straight from school on Friday for my sister and brother-in-law’s home. We had a great weekend and it was a wonderful way to end Shaylauary. It continues to break my heart that she no longer has a sister to play with and I am so grateful she has awesome cousins who bring her so much joy! Shayne did a fabulous job in the competition and it is wonderful he takes such great care of his health! It was great to all be back together again on Sunday! Gil treated us all to the circus in Cincinnati on Saturday night and we had a great time. 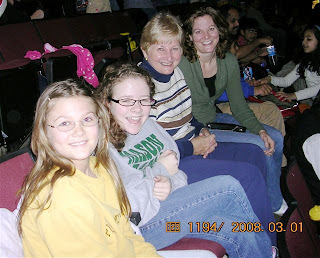 Of course the last time I attended a Ringling Brothers circus, mom was sitting with me too. We went with the Ronald House families in NYC when she flew in to help out. We both remembered how five year old Christi kept saying, “It’s not THE greatest show on earth. Who decided it was THE greatest show on earth?” She liked it, but disagreed with that title – what a hoot she was! 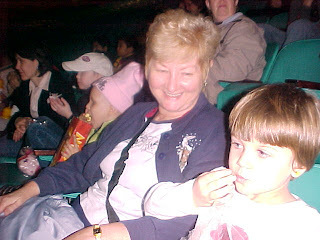 Christi (in pink hat), Grandma Nonee and Shayla at the Circus in NYC (March 2003) Christi is eating popcorn and sitting beside a little sweetie named Emma. Emma died of NB in June of 2003. Christi named one of her Build-a-Bear bears "Emma". I hope the girls are playing with their Build-a-Bears in Heaven and not looking back on the painful times they lived! 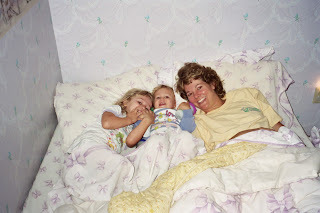 On Sunday evening, I set up Shayla’s new bedspread and removed Christi’s old one, fighting back tears all the way. Christi’s bedspread was ten years old and really needed to go, yet it was hard. I remember in the hospital in Philly in the winter of 2006, looking on-line to pick out a new bedspread for her room, but we couldn’t find anything we really liked. Things changed so quickly and then I didn’t want to touch anything in her room. Well, now that Shayla’s sleeping in there (and I think making it much easier on us to deal with “Christi’s room”) it was time to get her a pretty new bedspread. We ordered a lovely horse themed quilt spread that would go in Christi’s room just fine. It arrived and it looks great, yet broke my heart to take off Christi’s bedspread and sheets for the final time and put them all in a trash bag bound for the garbage. 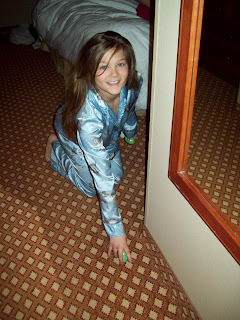 It was the only bedspread she ever had and I remember making up her room for the first time as I was pregnant and we were preparing for Shayla’s birth and transitioning Christi to her “big girl” room. After the bed was made, I placed some quits that had been lovingly stitched for Christi over the years by sweet “Angels on Earth” and I think that made me feel better for whatever reason. Shayla continues to do very well and has not watched TV, her Lenten sacrifice. I am very proud of her. 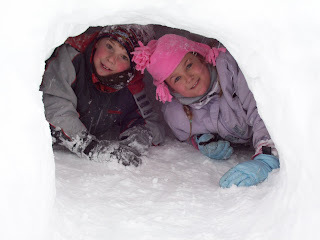 Due to yet another horrid ice/snow storm and level 3 road conditions (only emergency vehicles can be on the roads) we do not have school again today (Day #9, summer is getting shorter and shorter, oh well I’d much rather have everyone be safe!). I do not know if there will still be musical practice tonight or not. The show is this weekend. I’ve volunteered to French braid all of the little girls’ hair so hopefully all will go well with that. 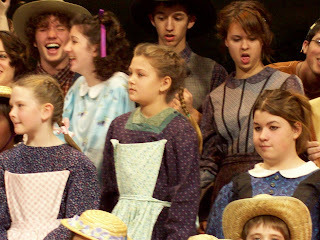 Shayla’s very excited. Shayne had to fly out today, but he’ll fly back tonight and thankfully it was only from the Tiffin airport so he didn’t’ have to try to get to Detroit or Cleveland or someplace he wouldn’t have made. We went to bed together like this on many occassions! Christi's "bed" was really just a matress on the floor because we were afraid she'd roll out and get hurt when we took her out of the crib to get ready for Shayla. She never did and eventually, she got a real bed - a hand-me-down from my college apartment. Now it's Shayla's and we still say it's the most comfortable bed in the house!